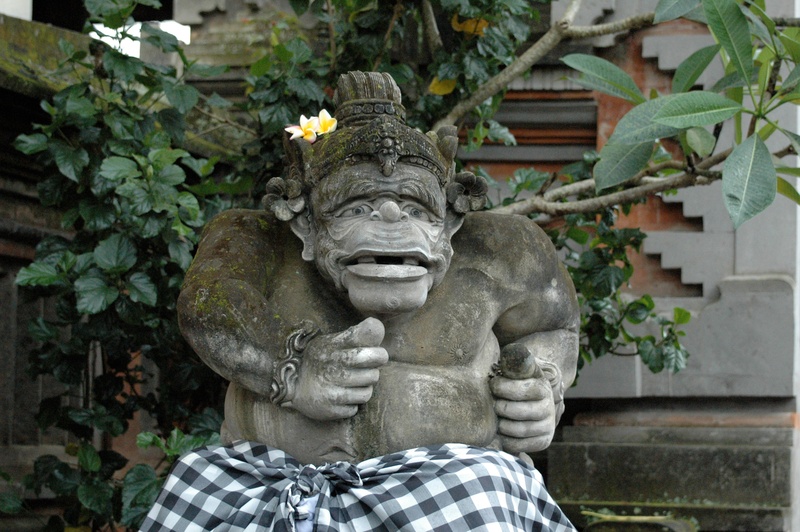 Why does the Bali statue wear black and white checkered clothes? 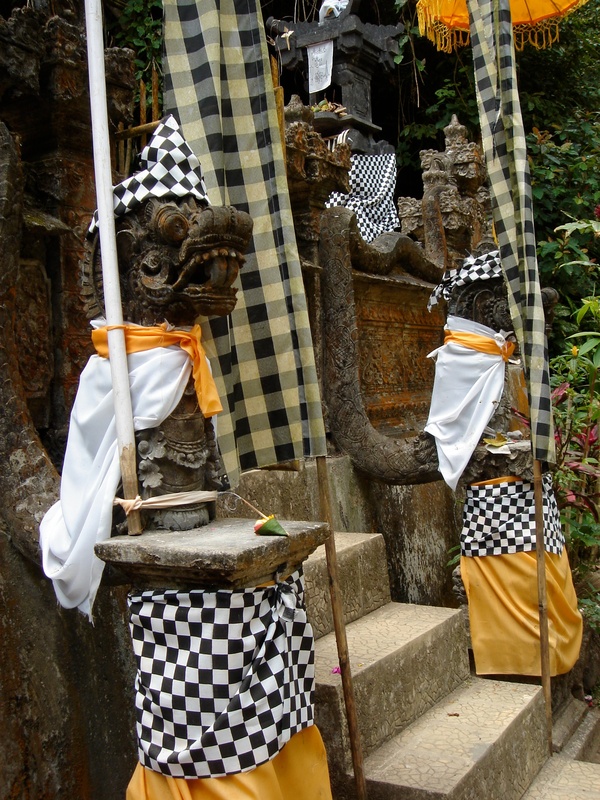 Everywhere in Bali you will see the black and white checkered textile. Near temples you will see it being used as decoration, for umbrellas and as sarong. You also find it wrapped around statues, tree trunks, rocks or shrines. Why is this and what does it mean? 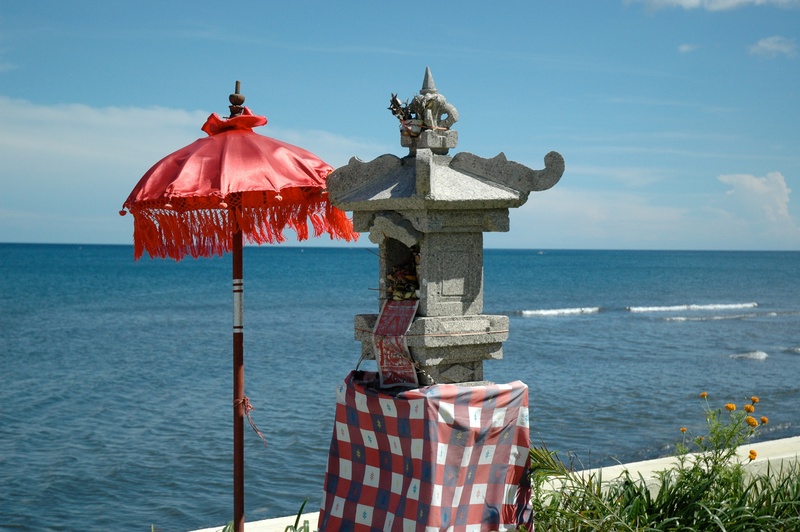 Everything goes back to the Balinese philosophy of balance called Rwa Bhineda. This philosophy of balance and harmony can be found everywhere in Balinese everyday life and it is symbolized in the black and white trademark textile of Bali. This textile is called saput poleng. Saput means ‘blanket’ and poleng means ‘in two tones’. In the cloth there is an equal number of alternating black and white squares. Together they symbolize the coexistence of opposites and the ultimate goal of harmony. Some of the saput poleng cloths will also include some grey or red squares. The grey squares symbolize the transition between black and white or the transition between good and evil and the red squares symbolize energy and passion. The Balinese believe in mutual dualism, comparable to yin and yang, They believe that there is no joy without sorrow, no night without day. They understand that there will always be good and bad in the world and in everyone. Their goal is to make efforts for the sake of balance and happiness for all of us. Balinese will for exemple never celebrate too excessively because they believe good things and happiness will eventually be balanced by sadness. They embrace differences because these create harmony and balance. They will not use differences as an excuse to show hostility or egoism. Differences are beautiful and must be balanced in order to create harmony in life. So why are some trees or statues wearing a sarong in poleng cloth then? When an object is wearing this cloth, it means that a spirit resides within. The cloth keeps the spirit and its energy inside and also protects the people from being disturbed by the spirit. And because the special cloth is the symbol of balance, the locals will treat it with a lot of respect. When locals see a shrine or tree wrapped in a saput poleng they will honor it by praying or honking when they pass it. They believe if they fail to do so, this could anger the spirit inside the object which can bring them bad luck. Bali is full of Hindu temples that are unique in architecture and structure. Tooth-filing or metatah is an important Hindu Balinese rite of passage. Bali is a wonderful destination. Book your stay with us now! Copyright © Villa Bossi Bali 2015. All rights reserved.